Before starting, I should note that I am a fan of the TV series, but I will review the anime as a standalone piece. I will put myself in the shoes of someone, who has never heard of Supernatural and evaluate its merits and faults from there. The story is simple and easy to follow. It is about Sam and Dean, two brothers who hunt demons and evil spirits. Most of the episodes are following the “monster of the week” formula… but there is a general plotline that advances slowly throughout the series. There is also a main villain and the Winchester brothers have a personal score to settle with him. Unfortunately, there are a few filler episodes with weak story and unoriginal enemies. The personalities and the interaction between the two brothers makes the difference between Supernatural and other similar TV and animated series. Sam and Dean are not perfect and flawless superheroes, they are normal persons. They can make mistakes, they can be paranoid, confused or angry and they always argue with each other. Because of that, they are a more realistic type of protagonists and the viewers can relate more to their problems and challenges. The animation is decent, but not perfect. Some things bothered me, like the awkward looking faces… but if you deal with demons, your face will probably look strange too. There are also some good ideas, like the excessive use of black ink in every frame, which creates nice contrast and the camera movement during some of the action or driving sequences, which almost makes you feel the action. The music includes some nice and slow themes, which create mysterious atmosphere. The good sound effects (like the Impala’s engine) and the occasional scary noises enhance the whole experience and should also be praised. Supernatural has interesting heroes (and villains) and manages to create a scary and tense atmosphere, through good use of sound effects and music. There are a few great and very dramatic episodes with some interesting plot twists. The ending is above the average. It leaves the story open, but also gives some sense of completion. What hurt the whole experience is the lower quality of the stories created especially for the anime. I also expected Supernatural to be a bit darker and scarier. If you are not familiar with the series, the flashbacks in the beginning would be confusing and meaningless. However, little by little the background story and the important details are explained. Basically, Supernatural feels more or less complete on its own and watching the TV series before starting the anime is not an absolute must. It may even have a negative effect, as some fans of the TV series hate the anime, because “it is not exactly the same”. You can be smart and ignore them. 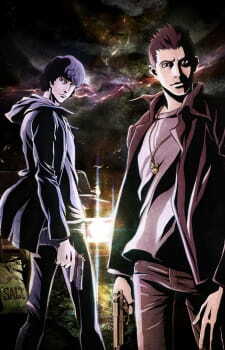 Supernatural is a great series for any fan of the mystery/horror anime. This is a creepy show. Having not seen the live-action show before, I don’t know if it does justice to the show or not but I have to say, I really like it any way and it does make me want to see the original show. The episodes all have to do with someone dying in a gruesome way, then the brothers’ end up being at the right place at the right time. Each show is its own storyline without many things to link them together. The story is slow, and not really action orientated. Many of the shows act more like detective shows where something odd happens and they discover why only to have a small action scene at the end. There is a larger mystery that they have in this show about the brothers trying to find their Dad. The art style is rather interesting, almost a cross between anime and American comic book style. The characters are hard edged, and a lot of dark lines and heavy shadows that pretty much are black. Everything has a nice vintage feeling, sort of grimy in a good way. The characters look like the characters from the live-action as well which is what I would wish to see unlike some of them. Sadly, some of the images are pretty frozen, still images that feel like cop outs, especially when this was made in 2011. The English voices don’t feel up to par with the animation, and feels a bit forced and doesn’t match the lip sink most of the time. They talk when the mouths are closed and part of it might be to get information out since this is shorter then the actual show. Even then, it just feels rushed and makes it a little hard. I really love the ending song though. I never thought I would hear “Cary on my Wayward Son” by Naoki Takao fit so well. EDIT: I have now seen the live action show, I really like it as well. The show has the same creepy feeling and the same slowness that the animation has. The stories are altered slightly from the original but that’s partly because they were putting a 1 hour episode into a half a hour one. As many of you are already well-aware, Supernatural is one hell of a series and for those who know it, seen it, love it I believe the animation is also worth seeing. But for the sake of a fair review, I'll try not to compare it (-much-I do compare it) with the original series. So, the story is definitely interesting. Two brothers hunting down all kinds of monsters thought to be just fictions of mythology and legends does sound appealing. The series includes remakes of the original episodes and anime-only episodes, too. As far as the latter is concerned, I believe they fitted with the original series. But the 22 episodes just wasn't enough to explain the plot thoroughly. Many questions arise and, honestly, I am not sure if I would understand the story so well if I was not familiar with the live-action series.. Lastly found the ending fair enough, I repeat for someone who is not familiar with the original. The art was a real fit. I mean the intense black in the frames fitted well with the mysterious style of the story. And, the characters were decent. But, I cannot restrain from commenting on Bobby's appearance. Man, what did they do to him???? (sorry about that). I haven't watched it in Japanese so I'll comment on the dubbed version. Okay, the voice actors have risen huge complaints. Why Jensen Ackles is not in the show? What's wrong with the voice actors? And bla bla bla... Really, the voice actors were not that bad. They could have been better and having the original cast would be sweet but we should try being just a little objective. Also, the music and the sound effects created the mysterious-creepy atmosphere the series needs. What I found a bit disappointing were the characters. I can't be objective here because I know the potential of the characters. They are not as flat as the anime portrays them. They are more deep than that. Also, many characters and monsters had to be there. What about the guys from the Harvelle's Roadhouse and the shape-shifters? However, we cannot expect that much from a 22-episode series while the original is 10 seasons! If you are new to the supernatural world I think you will like them as they are. They are not some kind of heroes, they have flaws and make mistakes. If you like this kind of stuff -demons, vampires, werewolves, etc.- you will definitely like Supernatural. Even if you don't have a particular interest in those, I believe you will still enjoy it. It is a great anime and leave us, grumpy fans, complaint. It should be treated with respect and it is a great anime for the mystery/ horror fans out there! Because I had never seen Supernatural I thought this would be a good way to at least get the gist of the show. I actually really liked it and I don't know how much of the show it actually covers but the animation is done really well and I was a little disappointed that there was only 22 episodes. I could easily watch the entirety of Supernatural in this format, I also watched it in the English Dub which I know at least Jared Padalecki voiced his character Sam. Although, if the series ever did continue I am well aware that having the original actors for the character's voice them for the entirety of the anime would be unlikely as it would take up a lot of time so I'm glad that the episodes that were made were voiced by him. Overall, I really enjoyed it and I feel like it was still intense and enjoyable in this format. I'd definitely watch it again.